Aren’t these little guys delightful? 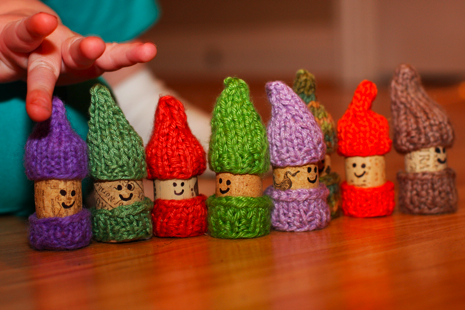 My friend Debbie made these happy little cork people for my daughters. I had the girls sit and cover their eyes when I gave them each a bag of four. They were super excited when they saw them. The first thing they did was race them across the floor, then they loaded them into Amelia’s little dollhouse. After they calmed down a bit they lined their little cork people up and Abby asked me to take a “family photo.” It’s so wonderful to be the mother of two little girls who LOVE handmade gifts. Thank you so much, Debbie. We have been delighted and entertained by these little cork people. If you, dear reader, would like to knit some happy cork people of your own, you can find instructions to here. Both winners will receive a copy of Amy’s new book, “Amy Butler’s Little Stitches,” an individual pattern and a fat quarter stack. Previously announced winners of this giveaway include Sarah who also won the BIG package of Amy Butler goodies listed above. And Risa, Kari and Janey each won a selection of Amy Butler patterns. Congrats to all of you. And, winners, if you haven’t already, please send me your mailing address so I can ship out your prizes. Thanks to everyone who listened to the podcast and entered the contest. And a very special thanks to the amazingly talented and generous Amy Butler for donating all the great prizes. CraftSanity episode 89 is on the way folks so get ready! We absolutely love your blog and find the majority of your post’s to be exactly what I’m looking for. Do you offer guest writers to write content for yourself? I wouldn’t mind publishing an article or elaborating on many of the subjects you write with regards to here. Nice website!